Strong demand for emerging market debt and equity assets should remain, according to experts in the field. The momentum of investment and growth in and from emerging markets continues, despite claims of a ‘bubble'. 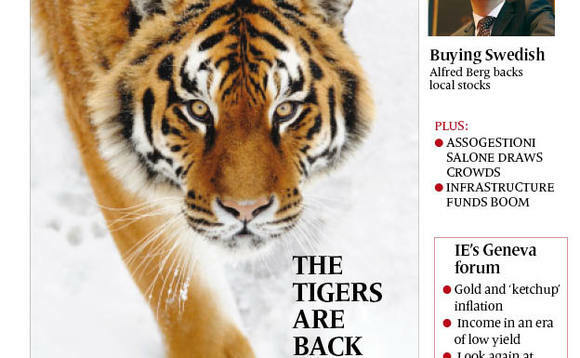 With sustained economic growth, low debt levels and favourable demographics, the ‘Tigers' are back. Strong flows continue to both debt and equity funds, and returns look so favourable compared with the paltry yields available elsewhere, that some analysts have warned of a ‘bubble'. Some of the biggest emerging market funds have introduced front-end fees to deter inflows. However, both debt and equity managers are convinced that the asset class has a lot more to offer in terms of both structure and performance. The old argument of the degree of correlation between developed and emerging markets continues, since diversification was one of the original attractions of the asset class. But now the story is about domestically driven economic growth, linked to, but not reliant on, developed markets. Emerging market debt now enjoys greater depth and better liquidity, while valuations in equity markets are at their best levels for many years. Local currencies are appreciating on the back of rapidly improving economic fundamentals, and corporate governance concerns are being addressed. A report from London-based data and research firm Clear Path Analysis cites Gregoire Haenni, CIO of the CERN Pension Fund, pointing out the re-rating of Asian sovereign debt, underlying economic growth, which has capped government debt to GDP, and trade surpluses, which have helped build up foreign exchange reserves. Many emerging markets, especially in Asia, are shifting their economies from export dependence to a focus on domestic consumption. Young and growing populations are beginning to demonstrate the buying power that will change those dynamics, Haenni adds. Jonathan Mann, head of emerging market debt at F&C, points to the strength of sovereign balance sheets over the period since 2007, with consistent credit rating upgrades. Ratings agencies have been widely criticised, but investors still consider their views before committing. In October 2012, Moody's assigned first-time public ratings to Kenya, Nigeria and Zambia, while Standard and Poor's raised its long-term foreign and local currency sovereign credit ratings for Nigeria to ‘BB-‘ from ‘B+'. The number of countries issuing US dollar-denominated offshore sovereign bonds has climbed from 36 to 57. "New issuers this year may include Kenya, Bangladesh and Thailand," Mann notes. He adds that developed market investors generally are now prepared to look further afield to secure yield and capital growth. "There is return potential from accessing this new generation of countries on an opportunistic basis, increasing allocations within a more mainstream portfolio when conditions are supportive. Examples of these countries include Angola and Azerbaijan." Mann warns that returns will be balanced by higher associated risk. "Key to [investment] success will be the detailed understanding of the political and economic drivers at work within each economy." Greg Saichin, head of emerging market and high yield at Pioneer Investments, told Clear Path Analysis of the potential returns from EM corporate debt. Before 2008, a preferred method of accessing capital for emerging market companies was via syndicated loans, he noted. In 2007, banks wrote $400m in syndicated loans in emerging markets. Between 2009 and 2010, as Chinese GDP growth accelerated from 6.2% in Q1 2009 to 11.9% in Q1 2010, syndicated loan volumes dropped to $175m, pushing emerging market companies toward the bond markets. The result: between 2008 and 2012, total emerging market corporate debt stock doubled. The recent shortage of emerging market sovereign bonds "has simply underscored the appeal of corporate [debt]", Saichin said. Total emerging markets debt is estimated at $11trn, with $3trn in investable bonds. Many managers believe institutional investors in developed markets still hold too little in emerging markets, given their growing contribution to global GDP, and a re-balancing will have to occur, pushing up demand. Bernhard Koeck, asset manager at VBV Pensionskasse, says local currency debt "has become a very big market, with countries wishing to issue currency debt in the same way they receive their revenues". With exposure to currencies and emerging market yields, it provides investors with two different sources of return in one strategy. The clearest indicator of managers' continuing faith in emerging markets opportunities is their hiring patterns and fund launches.